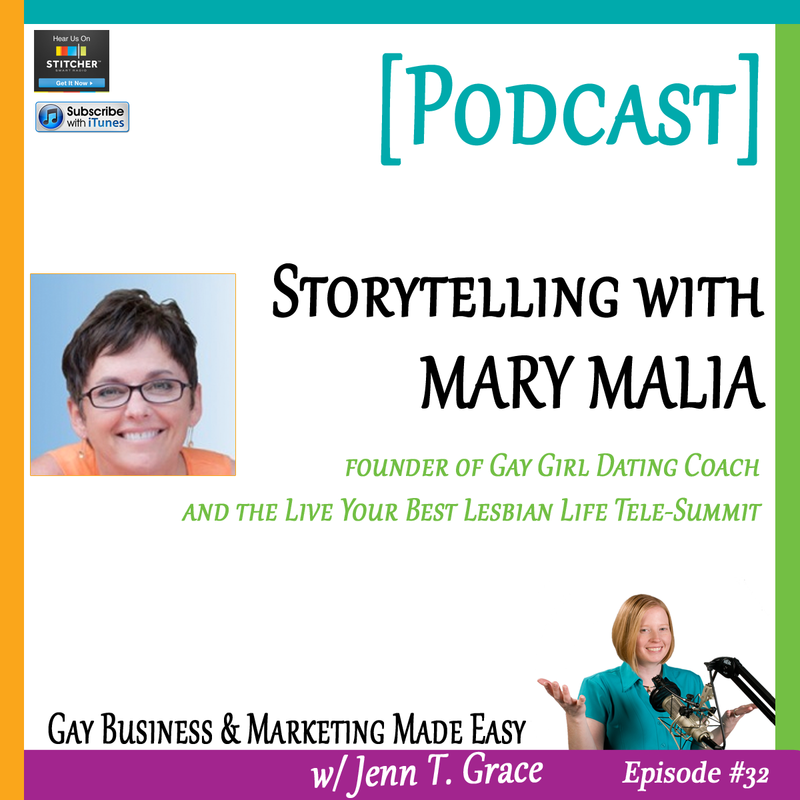 This podcast interview is with the Gay Girl Dating coach Mary Malia. 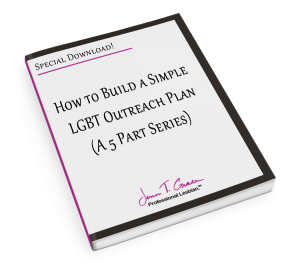 We cover all sorts of things in this podcast but really dive deep into the marketing concepts that can effectively reach a lesbian audience. We had a great conversation and hope you enjoy listening to it! If I’m not lesbianed you can’t be transgenderedRelationship Building Requires a StrategyWhere can I find good LGBT stock photography? 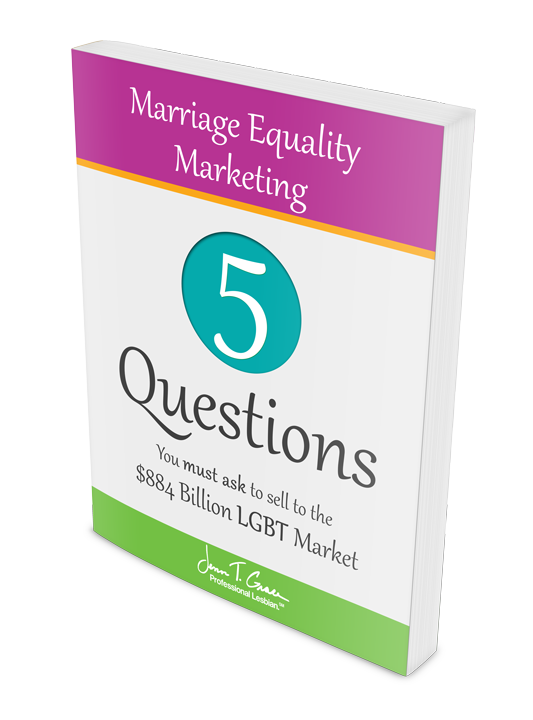 You are listening to the Gay Business and Marketing Made Easy Podcast, episode number 32. Well hello and welcome to episode number 32 of the Gay Business and Marketing Made Easy Podcast. I am recording today from the sunny, sunny area of Connecticut where spring has finally sprung. It is April, and finally we are done- well we appear to be done with winter, although the other day we did get three inches of snow unexpectedly. So maybe I shouldn’t talk too soon. But I am quite pleased, and because of the fact that spring has sprung I have my slider door open, so you will likely be able to hear the garbage truck that was just rolling by, my cat chattering at the birds, or the birds themselves. So it’s just a warning that there is a little bit of background noise today. But I can’t possibly even imagine shutting the door because the weather just feels so nice, because it has been such a long, unpleasant winter. So with that being said I am quite pleased to bring you an interview today with Mary Malia who is the Gay Girl Dating Coach. She had- I feel like this was an awesome interview, I had so much fun doing this with her, and I’m really, really excited for you to have a listen to today’s episode. But I do want to just kind of talk about a couple random things first as I usually do. And the first of those random things is the fact that this coming Saturday, April 5th, is my first race, my first road race on my journey to completing a half marathon in November. I really just started kind of picking up speed in terms of- not speed literally but picking up my pace if you will, in terms of really training for this half marathon. So I really kind of kicked it up a notch in February, and I went through February and March, and I’m doing a 5k so it’s nothing too exciting, too extravagant, but it is my first race of the season so I’m super excited. I have many 5k’s, 10ks, 8 milers, 10 milers, you name it, all planned between now and November when I run the Disney Wine and Dine Half Marathon in Orlando, Florida. So I’m pretty excited about that. That’s really I would say the only big thing in my personal life happening right now that I wanted to share, since you all have been on this journey of my racing endeavors as I’ve been sharing updates as I go along. So that’s pretty exciting. Another thing that I want to mention, is I talk about LGBT chambers of commerce a lot. And if you are a long-time listener of this podcast since we are done- somewhere over sixty episodes, you’ve heard me talk about them. There’s no two ways about that. And I have some interesting news. I have now been voted on to be the Vice President of the Board of Connecticut’s LGBT Chamber of Commerce. It is the same chamber of commerce that I was once the Executive Director of, and I left that post a while back. And there’s been some leadership changes and both myself and a former board member, Stacy, have both rejoined the organization; and she is the President, and now I’m the Vice President, and I’m really excited about what is to come with Connecticut’s LGBT Chamber of Commerce. I don’t want to say too much here, because I know a lot of members of the chamber do listen to this podcast which I love and adore you, so thank you for listening. But there’s a lot, a lot, a lot happening, and hopefully in the next- maybe the next podcast I’ll be able to go into far more details on some of the changes. But I just wanted to reiterate the importance of the LGBT chamber of commerce in your area. So if you are in an area of the country where you happen to have one, you should absolutely run out and join, and really get yourself involved. And if for some reason there isn’t one in your area, perhaps you should consider starting one, because there’s no time like the present. So I just wanted to throw those few things out, and maybe next episode I’ll really focus more on- a little bit more on the importance of them if I haven’t beaten that horse to death as it stands yet. But I just wanted to mention that because I’m really excited about what’s happening, and all the changes to come, and hopefully all of the new avenues that it will leave for my business, but then also for me to help your business. So it’s pretty exciting, just wanted to throw that out there. And let’s see, the other- so there’s two things that I wanted to mention and then I’m just going to hop into the interview. And the one thing, and I say this on every single podcast I do, is I would love to see you on my next webinar. So the next one as it stands is April 15th; I know it’s tax deadline day, so for those of you who are in the tax and accounting field, or you’re bookkeepers, or whatever you happen to be, that tax day certainly affects you, do not worry we will have one after April, there will be another one in May as well. But for those of you who are not affected by the tax deadline, I would really encourage you to come check out the next webinar. 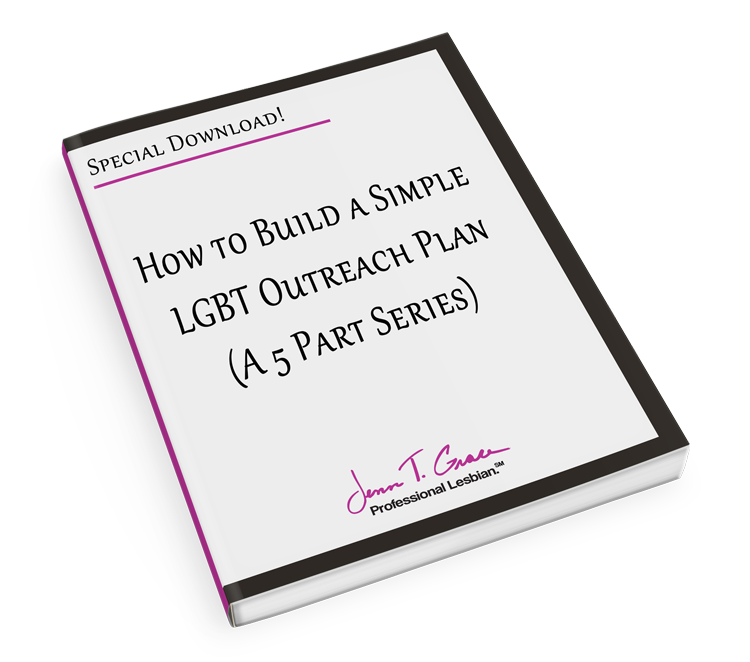 The title of the webinar is always, ‘Increasing Your LGBT Market Share Through Authentic Communications,’ and it’s really- I kind of tweak it every single month, and I add different case studies, and I take out things, and I change things around based on what’s been happening as of late. So no two presentations are identical, so if you have been on one before, certainly don’t think that that stops you from coming on one again. So definitely check it out. You can head to my website at www.JennTGrace.com/webinars. So yeah, definitely check it out, April 15th is the next one. And then the other thing that I wanted to mention is to join my mailing list. I would love to see you on my mailing list. So it’s the Gay Marketing Insider, and I deliver some really good content to you, completely free, no strings attached, on about once a month basis just to get you headed in the right direction in terms of your LGBT marketing efforts. So I have a lot of information on my website, and I try to just boil it down and send you the very best in this monthly format. So I really keep my emails to a minimum, I don’t want to overwhelm you, so if that’s of interest to you, please head over to the website. And when you get there, there’s a link or a box on the right hand side that says, ‘Join the Gay Marketing Insider.’ I would totally love for you to do that. So that’s really all I’ve got going on for right now. 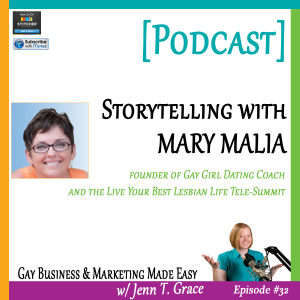 So let’s just not waste any time, and hop into our interview with Mary Malia who is the Gay Girl Dating Coach. This was every day I lived like that. And when I finally left the nonprofit world, that was part of my ‘I’m finding a way to be out everywhere in my life.’ And really through that experience, my experience of coming out later, and realizing it’s not easy to come out later in life, it’s not easy to build community, it’s not easy to meet somebody to be in a relationship with, it takes some real determination. I didn’t come out because I had an affair, I came out because I came to, I woke up, I got conscious about myself and realized I need to do this, I can’t stay where I am anymore. And I need to start living as honest a life as I can, which was part of the reason it was really hard for me to not be out in my executive positions. And so I really- part of Gay Girl Dating Coach for me is about living my life out loud. And at the same time, really helping women in an area where I personally had so much struggle, and I see women still every day struggling, struggling, struggling, struggling, and it doesn’t have to be that hard, and it doesn’t have to be such an intensely difficult process to both be single and to really find a great relationship. Wow, that- it’s so impressive that you went- you kind of transformed yourself from having that fear and anxiety on a regular basis to just really living your life completely out in every facet, which is totally awesome. And I have a question that is not one of the ones that we talked about before, but based on something you just said, is you work with women who- so let me ask you, because you are the Gay Girl Dating Coach which I love the name, that’s awesome. Are you working with women with their struggles of actually coming out, or just dating struggles in general, or is it possibly a combination of both? Well I would say it’s a combination of three things. I work with women who are coming out, and really trying to figure out how to lesbian culture. Because there’s a lot of rules out there in lesbian land, as our little lesbian nation, it has all its own set of rules. And if you come from being- living a life of heterosexual privilege, having been married, and you walk into this you’re like, ‘What the heck is going on out here?’ You’ve got to learn the language, you’ve got to learn the rules and they’re frequently invisible and unspoken until you run into them. So there’s that, so I work with women like that, I work with women who just are struggling with dating. They might have been single for a little while, they might have been single for a really long while and given up on the whole dating thing. But they really want a relationship. I work with women who have lost their partner, they’re widows, their partners died. And they’re really struggling with how do you date? I mean if you haven’t dated in fifteen years, everything about dating has changed. Everything has changed. And then I work with women- like I have a client right now, she’s a foreign diplomat in India. Her eighteen year relationship ended, she’s not struggling, she just realized, ‘Whoa I haven’t dated in eighteen years. I don’t know what to do out there. Could you teach me how to do online dating? Teach me how to think about that. Teach me about long distance dating, and give me that information, let’s do some little skillset kind of stuff,’ and off she goes. So really it’s sort of this narrow swath of needs, but it all focuses around ultimately dating, but I always think dating is really- when you start thinking about dating, it’s about the rest of your life and all of your life. Wow, that’s pretty cool. That’s really interesting. And it’s such a niche within a niche within a niche. Which you know, that’s the way I roll, that’s the type of business I’m in. Could you give us an example of what one of those rules might be for listeners who are- so a lot of my audience are straight allies, and a lot of them are part of the community. So I think it might be a little interesting tidbit for those who are not part of the community to understand like the types of nuances that even we, within the LGBT community, are dealing with. Sure. Well I think let’s start- and you get this one Jenn, and I know you teach about this. LGBT, they think of us as one big homogenous like in the blender, we’re all the same, we all love each other, we’re all getting along, and none of that’s true. Ultimately there’s a great deal of friction between the L’s, and the G’s, and the B’s, and the T’s in certain arenas and about certain things. There’s lots of misunderstandings, there’s lots of bias against each other around certain things. So you start with that. So and then we go to some of the real stereotypical things that people think, which is, ‘Well if you’re a lesbian then you’ll go out with any lesbian.’ Well, no. No. The answer to that is simply no. And because I’ve come out, and I’m really excited, and I think I’m great, and I think I’m wonderful, I’m just going to go running into the nearest lesbian community event and they’re all going to welcome me like, ‘Yay! Look, another lesbian!’ And the truth is they’re like, ‘No.’ No it’s not going to be like that. Most women- certainly women who define themselves as lesbian, who’ve lived their whole life out, and you come marching in at thirty, or forty, or fifty, or sixty you’ve come out late, and you’re really excited, and they’re like, “Would you go do that somewhere else?” They- you know many women who’ve lived their lives out have been really burned dating women who just came out. Because we’re- this is I’m raising my hand here. I came out, I was so excited, I’m like, “I’ve waited 45 years to do this, let’s go! Yay!” And I ran around like a mad woman. Well that’s exactly what it is, you are a teenager. It took me going through like four therapists for one to finally give me that model to work with. She’s like- she says, “Mary it’s like you’re fourteen and you’ve never dated anybody. You have no idea what you’re doing. Dating a guy is not the same as dating women.” It’s not, it’s different. And so there’s these sort of lessons you go through, the experiences. Everything from how far out are you? How many people in your family or friends, your network, your children know? Are you going after a lesbian who’s all the way out in her life? She’s probably not going to want to date you. If you’re not out, you’re hiding in the closet, no go away. I don’t want to- I’m not going back in for anybody. I mean that’s one of the things I’ve seen women bang up against, is you know, ‘Well it’s going to take me a while to do that.’ You know, well then come back when you’ve done it, because I’m not going in for anybody, I’m not pretending I’m your friend. I live my life out. So there’s those kinds of nuances that somebody who’s just coming out doesn’t understand. And on the other side, somebody who’s just coming out can be prey to somebody who just thinks, ‘I’m going to play a game here.’ Who isn’t very ethical about the way she dates, or the way she’s in a relationship. And so she’s like, “Oh great somebody who’s just come out, well I’m going to take advantage of her naivety to have a good time for myself, and laugh.” So I mean- and I’ve been sort of party to that in lots of different ways. I mean as the victim of those things- I don’t like that word ‘victim,’ but I’ve had that experience. Like I’ve had somebody who dated me just because it was like a science experiment. She never meant to be serious and I was getting serious. And then of course I got hurt when she was like, “I’m not doing this anymore. Oh come on, we were never going to be serious.” It’s like oh I didn’t know that. Wow that’s a lot of nuances. I’m glad that you brought up- you brought up some really interesting ones, and I’m glad that you brought up the fact that a lot of people just make an assumption that the LGBT community kind of lives in harmony and we’re just one big group of folks. And how really- how far from the truth that is in actuality. And like you said, that is something that I teach a great deal about. Because it’s just so important and obviously it’s important in your business as well, that people don’t think that. So this has been great so far, and one of the newer questions that I’ve added to my roster of things I like to ask my guests, is around a coming out story. And I’ve been asking it towards the end but since we’re talking about coming out and all that kind of stuff, maybe now would be a great time to ask you if you would be willing to share one particular coming out story. Maybe it’s something in your business, something in your personal life, just something that had an impact on you. And the reason I’m asking this question is so my audience who haven’t had that experience of having to come out, can just get a better understanding of what it might be like in the mind of someone who’s LGBT for even just a moment, because I think that that does have a direct impact on how they communicate and try to market to the community. Isn’t it funny? And then of course he outs me to numerous other people which is part of what happens with the coming out process. It’s a chance you take, right? That is funny. Oh I have such a visual of like him skipping through the office announcing that you’re a lesbian. It was sort of like that, yeah. That is pretty funny. And something that you just said in that last- one of the last couple of sentences. I have been wanting to write a blog post about this for eons, but since you are just as much a professional lesbian as I am, I would love to hear your take on the proper usage- and I get questions from people at complete randomness, random questions. And the difference of using the phrase- just saying, ‘she’s lesbian,’ or ‘she’s a lesbian.’ So have you had anyone ever ask you how you identify, and somebody- if you say, “Oh I’m a lesbian,” they have some sort of issue with it? Or if you say, “I’m lesbian,” they have an issue with it? Because I have yet to been able to find enough research to properly put together a blog post around this. But I hear it on a regular enough basis that I probably should prioritize this. Well I think it’s an interesting and unusual question. I told you I’d hit you with something. Sexual orientations, does it fit or not? Well but see that’s because heterosexual people don’t identify the word lesbian as lesbian is inclusive of you have to be a woman to be a lesbian. So you don’t have to use the descriptive lesbian- woman with lesbian, but these are semantics. But you know what, this is a fun fact for the straight audience who’s listening to this, because at the end of the day you immediately- so if somebody were marketing to you as an LGBT consumer, and you saw that somebody put ‘We cater to lesbian women,’ or something to that effect, you’re going to know immediately that someone didn’t really do their homework. So that’s a great marketing tidbit and I’m actually going to ask you about marketing in a couple of minutes, but we’ve already got a gem out of here, so this is great. So we’ve already gotten like twenty minutes into this interview, and I normally like to ask a really random question at the top, so I’m just going to break it up and ask some randomness now on top of the most recent randomness. Is there a fun fact, or just something- because we talk about a lot of serious stuff here, but is there some kind of fun fact or just something completely random or obscure about yourself that so few people know or would expect from you? Just anything random. That’s my word of the day. Wow, let’s see. Sure here’s a random fact about me. I think it’s a fun fact because it tickles my fancy these days when I think about it. When I was a child, eight years old is particularly the age that comes to mind, my happy spot was the library, I loved the library. I lived at the library. I would take out as many books as they would let me as often as they would let me, and I devoured books, and discovered that books for me were both a great way to learn, but a great refuge, a solace, a place that I would go and read a book and it would make me feel differently about myself, and make me see differently. And I remember at eight years old sitting on the front steps of the house, and saying maybe to myself or somebody else, “I want to be a writer, I want to write books that make people’s hearts feel better.” And so for years I would get a piece- I’d get a bunch of paper out and I’d sit down at a table, and I’d go, “Okay I’m going to write my book now.” And I’d sit there and have nothing to write. I had nothing to write; I’m eight, I’m nine, I’m ten. I think by the time I was twelve I was just like, “I give up, I have nothing to write.” And I mentioned this to somebody actually this week, and I said, “And now I’m a writer.” I include that in that is a descriptive term of what I do, I write every day of the week, I blog all over the place from Huff-Po, to www.DatingAdvice.com, I just talked to the Dating Warehouse which is in the UK, and they’re international, and I’m going to be writing some articles for them. But that writing is what I do now, and for me the fun thing was the realization one day when I connect it back to that eight year old part of myself and went, “Hey! Hey there eight year old Mary, look what I’m doing! I’m writing!” But I had to go through all that life experience to write what it was I saw myself doing at eight years old. That is awesome. It’s so cool when stuff like that happens. And I think that because you are- you know a dating coach, I would imagine that you’re so much more in tune with yourself. So you’re able to actually really dig deep and reflect back on things that actually make sense now. Versus I feel like a lot of people are just kind of closed off to their emotions, and to their past. So that’s probably a really good benefit in your business to be able to see those things in retrospect. Well thanks. Yeah I think it is, and it’s something I do periodically sit down and do a little meditation and go, “Okay what’s coming from the past that I could pull into the present?” I think it’s a great thing. Yeah, absolutely. And now let’s hear from our sponsors, www.MentalCompass.com. And let’s get back into our interview. So speaking of the present, did you- and I know that you know, it definitely seems to be that you love what you’re doing currently, and of course you had so many past experience examples of things that you were doing that you know, it all kind of fit together like a puzzle. But at any point in that journey did you have some sort of ‘ah-ha’ moment, or some kind of epiphany that you just kind of- it clicked that you realized that this is what you should be doing? Boy you know, that’s something I look at and go yes and no. When I left my last sort of corporate position, and I was extremely well paid, and it was for me, it was what I thought was like the next to last step in my career ladder. I was one step away from what I thought was going to be my peak kind of work in that field. And to walk away from it was very- a very both I felt, perhaps very much like a failure, and I had to find a way to feel really empowered about myself. And I guess my real ‘ah-ha’ moment was one day I was actually at a Tony Robbins event, I’m a Tony Robbins fan, obviously I’m a coach, I specialized in dating coaching because as I said, I think dating is a doorway into the whole rest of your life. And I was at a Tony event and I was still struggling with some things that had happened, and I learned this whole tool or strategy about shifting the meaning of the stories in your life. And so I had this story about what had happened in this last position that wasn’t positive at all, and it left me feeling very victimized. And so the whole premise of this exercise is well let’s shift the meaning, it doesn’t mean you changed the facts of the story, but what does it mean? And my big ‘ah-ha’ moment was realizing that I had that kind of power. I had the power to define what every single thing in my life has meant. And when I defined it in a way that freed me, that opened me up to be whoever I wanted to be, all of a sudden I realized that what happened in Austin, Texas set me up to live my life out loud, to live my best lesbian life, to take a theme from one of the pieces of work that I do. And that if it hadn’t have been for those- for the things that happened there, I never would have stepped all the way out of the closet. I never would have given myself that much freedom. I never would have given myself the permission to really do what was in my heart to do. And so that for me was a really big ‘ah-ha’ moment, and it’s something I teach all my clients that I just teach all the time. Whatever I’m doing; whether it’s just a free seminar, a free teleseminar, coaching, I’m always teaching about the power of story, and it’s when you shift the meaning, how much it can open up access to a whole new way of life, all kinds of opportunities that you’re missing, and a chance to really be your best self. Wow, that is really- that is incredibly interesting. And I feel like your ‘ah-ha’ moment seems a little bit similar to one of my ‘ah-ha’ moments, and I’ve been doing- I’ve been working in the LGBT space since the end of 2006, beginning of 2007, so it’s been a while now. But in 2012 I think it was, I had a really just terrible experience with one of my clients, and it was a significant client of mine. It’s what you’re talking about which was changing- kind of changing the story. And this experience just had me down in the dumps, and I just felt completely miserable and trapped from the situation, that it actually ended up- it’s like a pivotal piece in my life now because at that moment I just felt so much- I don’t want to say- I feel like mental unrest seems so dramatic, but I just felt so not right. And what I decided to do was just start exercising, and since August of 2012 I’ve now- I’m almost down fifty pounds since then, and I’m training for a marathon. So it’s like just those two things have changed my entire life so dramatically, and it really was just taking the power away from that person who made me feel like that, and then shifting it into the beginning of a new story and a new chapter. So it’s very similar to what you’re talking about. That’s such a powerful thing too, for people to be able to understand how to dig deep and be able to identify those things. So I guess if anyone is listening to this, then getting a coach, and especially if you might be a right fit for them, that would be a great exercise for everyone I think to go through. Right well I’m just going to point out something you just said, you know this idea of you talked about this thing happened with a client or somebody you were working with in some way, and it just- it just nagged at you constantly, and you finally found a way to reposition what it meant in your life. And then you used this term like sometimes you have to dig deep, you know what sometimes what we need to deal with is right in our face slapping us on the cheeks the whole time. And we’re just- we get so used to it being there, we get so used to either we build a comfort level around it, like oh that’s just always going to be crappy, it’s just the way it’s going to be. And the dig deep part isn’t the figuring out what the thing is that you need to change, it’s the getting- really getting the guts to just face it and say I’m not putting up with this anymore. I’m going to find a way through this, and stop tolerating the dissatisfaction that you have in your life. Yeah that sums up how I felt. I was like, I’m not- I’m putting my foot down, this is it, this is over. I can’t live like this. And really it started off as just needing to have like that mental clarity because it was taking up so much of my mental bandwidth, but then that transformed into well what are ways that I can actually feel more clear mentally? And that happened to be through exercise, and it’s completely changed my life, it’s crazy. So we’re talking about things that, you know are inspiring and motivating, and all that kind of fun stuff. So do you have anything in particular that keeps you motivated or inspired to continue doing what you’re doing every day? You know I have a couple of things. One is you know I mentioned I have children, my son is thirty and he’s off on his own living his life doing what I think are just amazing and wonderful things, I’m really proud of him. And my daughter is nineteen, almost twenty. She’s in school, in college in New York City. And I would right now in my life, the thing that inspires me and keeps me motivated the most is my daughter. Every day, I get up every day and go you know what? I need to show up and be an example for her. I need to show up and be a role model for her. And that means pushing through the hard times, and figuring out how to make the best of everything, and figuring out- and you know you used the term power. You know owning my power to really shift how I feel about any given event or thing that’s happening in my life. And so I always go back to her. She’s been my inspiration for a long time. That’s awesome, that’s so- that’s so awesome that that’s the case. And I have really small kids, so I feel like- I feel like they’re more draining to be perfectly honest at this moment in time. Small children are, that’s their job. So that was an excellent- just an excellent piece of advice, and that’s actually my next question. Is do you have any particular advice that maybe you were given along the road, if it’s business or otherwise, that’s just kind of one of those things that you kind of hold onto on a regular basis that keeps you chugging along? I do, and it is to take care of my health. Whatever you do, take care of your health. Nobody, nobody, nobody can do that for you. I’m right there on that. And so it’s another thing that I use to motivate myself on days when- you know, business was hard today, oh I tested this strategy, that didn’t work, or hey this worked but guess what? There’s nobody who’s going to exercise my body for me. If only. There’s nobody who’s going to eat well for me. You know even as simple as you know, there’s nobody else who can get up and go pee for me. So I guess I better go do it myself. So yeah that’s one of those. And today I actually started CrossFit. You know, you talked about all the exercise you’ve been doing and how it’s changed your life, it’s changed your perspective about yourself and your physical body. And so today I started CrossFit. And I’ve really had sort of just some insights into myself in the last- just in the last two weeks, about really how much we aren’t our bodies. We think we’re our bodies, but we’re not. My body is like my house, I need to take care of my house, I need to make sure all the systems operate properly, that there’s no water leaking, and this and that and the other Just like I have to take care of my car and keep it operating properly. I have this body, it’s sort of like a car or a house, I live in it and I better take care of it. So I would say it’s the one piece of really inspirational wisdom I got from my dad. I love that, I think that’s so incredibly important, and I feel like for me and the whole life changing ways of just even training for a half marathon, because that’s the first one I’m doing and that’s in November. And it’s just- you realize how much you’re capable of, just- and it’s all mental. Like I feel like granted some days like today I was at the gym this morning, and I swear I was going to have a heart attack. Like my whole right side was just like cramped up and killing. So I’m like, “Alright, maybe I’m pushing myself a little too far today.” But at the end of the day, like I feel like it’s entirely mental. Like occasionally you have those aches and pains that aren’t mental. But being able to push through like when you think you’re done, there’s so much more that you can do, and I feel like that’s so applicable to business. Instead of just giving up when something doesn’t go your way, there’s so many other ways that you can continue to push forward that you didn’t even realize were possible. Absolutely. And certainly, you know that probably has been one of the many lessons I’ve been learning in the last three years since I launched Gay Girl Dating Coach. That’s great. That is totally awesome. There’s so much I feel like we have so many good gems today, this is awesome. Yeah, I love talking to people that I don’t know that well, I know we’ve only had a couple of offline conversations before, so I think this is great to just kind of get it all out there. So I do want to shift gears a little bit and talk a little bit more about marketing and the LGBT community specifically. So for someone listening to this, whether they’re an ally to the community, or they’re part of the community; do you have any particular piece of wisdom that you think that you can provide that may make them a little bit more successful in what they’re trying to do? Hmm, well apart from really making sure you language things properly, that your copy is really appropriately worded. I think it’s important to understand that the community as a whole is sort of fractured, and sometimes it can be really hard to find big swaths of the right- you know of what you’re looking for. And so you have to be really creative. You have to- maybe go- you know use tactics that it doesn’t occur to you to use when you’re marketing to the heterosexual community. And but the same things always apply. It’s like you’ve got to build trust. You’ve got to create a sense of trust that you’re trustworthy. You’ve got to give the LGBT community the chance to know you, and in a way that speaks to them. And you know, so that know, trust, and like factor apply in everything that you’re doing in marketing to this community. And what speaks to lesbians is not necessarily going to speak to gay men, or to the bisexual community, or transgendered; and that becomes something then that becomes really important about if you’re trying to target just one part of that segment, to really think about what do they need to hear versus what do lesbians as women need to hear, that gays as men don’t need to hear, and vice versa. That is such an important distinction that you brought up, and the know, like, and trust factor is so incredibly important. I think ten times moreso with the LGBT community. But your point about the gender. And so I get mailings- I’m on everyone’s mailing list, so physical or email, because I want to see what other people are doing for their LGBT marketing so I can use those as educational touchstones. And one of the things that I’m routinely getting is somehow I’m on some mailing list for some cruise line, I don’t even know which cruise line it is off the top of my head. But every single one I’ve gotten in the last like two years has had half naked white men on it, and it’s like- and of course they’re white gay men. And it’s like you are not only alienating every single possible woman that would want to come on your ship, but you’re also alienating every other ethnicity other than just only marketing to white- white, gay men. And I think that that’s something that’s- to me it’s a little bit frustrating that marketers are continuing to kind of perpetuate these cycles. But it very much comes down to gender. I think if people just focused on like, ‘Okay LGBT, there’s lesbians, there’s gay men, there’s bisexual and transgender folks that could be male or female, we don’t know.’ And if you just really focused on marketing to women, and then trying to bring in that lesbian angle to it, or just marketing to men and bring in the gay male angle, they would have so much more success. I really think so. Absolutely and it’s even worse when it says something about being gay friendly, or LGBT friendly, or whatever wording they’re using, but yet they have straight pictures instead and they’re not including that. It’s like you’ve just wasted a lot of money. Yeah, I mean spend some of that marketing money, and get some good photos of two women together or two guys together. I always tell people, especially if they’re on a low budget to just crowd source. You know as your employees, ask fans of your company. People are more than happy to help the cause, especially I think all LGBT people recognize that marketing really is so significantly far behind in terms of what people are doing. So I think a lot of people are more than happy to share content, and share photos, that would accurately represent them in whatever medium it is. That’s great, I think that’s a great idea. And I know myself, in my marketing for Gay Girl Dating Coach, I struggle to find pictures that I think really accurately reflect the lesbian community. That don’t just look like two heterosexual women who had their picture taken together. Yeah, and it’s so- I feel like- I could get on a tangent about this one but I won’t. But I feel like when it comes down to imagery, it’s so important to make sure that they’re authentic. So to me if you’re having troubles trying to find those two women that don’t look like straight women, it’s really about finding two women who are actually together and telling their story. Because no matter what, you’re not going to please everybody. So if you’re using two women who look too straight, you’re going to piss off a lot of lesbians. If you use women that are too butch, you’re going to piss off the other part of lesbian land. So it’s kind of- it’s like damned if you do, damned if you don’t. And it’s one of those things that at least if you’re out there trying, I think that that should get most companies some good brownie points. Yes, I agree I think it does. I think it definitely does. And there was- so there’s a show called ‘Good Luck Charlie’ on the Disney Channel, I don’t know if you saw that they introduced a lesbian couple on that show. And the truth is, is that there are plenty of women out there who are lesbian and who look as heterosexual as any heterosexual woman. And my experience in travelling in the south, living in the south, living in Texas, you see a lot of lesbians who look at straight as the day is long. You would- they look- so there’s all kinds of women out there dressing all kinds of ways. You know in Maine, one of the stories up here in Maine it’s always funny, is you can’t tell the lesbians from the straight women here because everybody buys their clothes at L.L. Bean, they wear their hair short, they’ve got Bean boots, and it’s so freaking cold for so long, you have to- nobody wants to dress up in little skirts and heels because it’s ridiculous, it’s totally impractical. And so up here frequently you might think that woman across the way is a lesbian, and then her husband walks out and kisses her, and off they go. And you’re like, “Okay,” it’s a little confusing around here. So you know, it’s interesting because I think one of the privileges that we have as lesbians, is we have a lot more freedom to look different. And so lots of women look lots of different ways, and I think that is one of the fun things about the lesbian community. And I think that it goes back to that gender thing that we were talking about before, that I think women in general are just more free to look different ways versus men. There’s very- you know, there’s very clearly defined lines with men that if people cross, like suddenly now they’re being labeled metrosexual. Or then they’re being labeled that they’re gay whether they are or not, just because they take pride in their appearance, suddenly that makes them gay. And I feel like that’s such a terrible stereotype. Versus women, where you can be any range of woman and you don’t necessarily have to be labeled as being part of the community. It’s very interesting stuff. 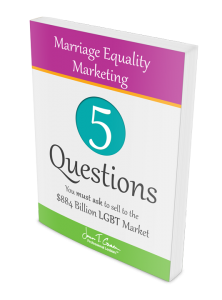 So let’s talk for a moment- and I feel like this may be an obvious question, but what are some ways that you’ve been able to leverage your status as an LGBT person in your business? Well I mean it’s an interesting question because I look at it and I’m immediately thinking of the places where I haven’t been able to make any end roads. But I mean obviously I leverage my status by doing things like the Live Your Best Lesbian Life local telesummit where I literally just email women who live as I put it- they live their lesbian lives out loud. You know women like you, myself, professional lesbians who make their livelihood by doing things that support community, create community, and help the lesbian community. And so for me that’s been how I’ve leveraged my status. Obviously I created Gay Girl Dating Coach, and I get out and I help women date. And part of that has been from I run three meetup groups that have over 3,000 women in them. And so that was part of my sort of testing ground for even the whole concept of Gay Girl Dating Coach, was what I had heard from all the women in those communities, what was working and not working for them, consistent themes of struggle, and where I went to from there. And so my- you know my status as an LGBT person, I mean I have people who come to me who want me to like be their lesbian spokesperson kind of thing, around things that they’re doing.  And one of them I’ve actually signed onto, which is creating the LGBT relationship network, which is designed to help the straight therapeutic counseling coaching community to better understand how to work with the LGBT community, and be more effective. So really it’s a form of marketing, but a form of really teaching them how to really understand what some of the blocks are, the hindrances, the barriers, and what they need to know to be effective as a therapist, a coach, a counselor. That’s awesome. That is such a strong need. And I have a really close friend who does that with the trans community. But for you to be able to bring that coaching and the therapeutic aspect of things; that’s really- I feel like really, really important because finding any type of therapist or counselor or doctor or anybody really, it’s one of those things where you have to come out, or you should come out; especially when it comes to like medical care. But it’s one of those things that people have a lot of hangups around, so it’s important for somebody to be out there educating those providers. And I always get so frustrated by that, and not necessarily from just the LGBT standpoint, but what about all of those kids that have some sort of other caregiver? So that’s excluding everybody- it’s excluding so many people, and I feel like that’s so unfortunate. And for somebody who’s looking to market to the LGBT community, especially if you have some sort of forms that people have to fill out, that’s like the easiest step you can take by just saying, ‘Caregiver,’ or ‘Provider,’ whatever the information would say, to be more inclusive, and it comes back to that language thing. Because you know you could put together a whole marketing campaign and be bringing in LGBT people by the droves, but at the end of the day if your form in the waiting room is inaccurate, people are not going to come back. Yeah, I think that it’s a really important point, and it’s something that is really easy to fix. Yeah a lot of these things that I feel like we’ve been talking about, and I talk about outside of this particular interview, are really most of the time very easy, tactical things that you can just fix immediately. And it makes such an impact. So we’re nearing the end of the interview, and I always like to ask this one question because I find that the answers I get are usually all over the map but really, really informative. So do you have a particular book or program or some kind of tool that you’ve used in your business that’s just kind of helped you either streamline things, or do things more efficiently, or just something that you’ve really enjoyed that’s kind of helped your business? You know there’s so many different things. And so I just sort of went to what’s the tool I’m using right now that is really helping me think differently about some things about my business, and it’s a book that was put out by a business coach, her name is Suzanne Evans and it’s ‘The Way You do Anything is the Way You do Everything.’ And I love that title, even as it reflects about our conversation today, about what can businesses do to be more LGBT friendly? Well believe me, the way you do anything is the way you do everything. If you get more LGBT friendly, you’re going to be more friendly to all of your customers. To all of your clients, to everybody you’re reaching out to. We fragment our lives in so many different ways, but you know if you show- it’s like you. You show up at the gym, and you show up with presents, and you get your work done and you push through; guess what, that’s how you’re going to show up at work that day. You’re going to like go- you’re going to carry that same attitude, that same motivation. And so sort of that place of when I talk to my coaching clients, I talk to them about dating with honor and setting a higher standard for yourself first, before you’re out there setting a higher standard for the woman you want to date next time. It’s like yeah but what’s your standard? What do you do with your life every day? How do you live your life every day? Because you’re going to accept into your life the quality, the level of your standards for living. So get real about what that’s about. And so I loved this book, I think she has some fabulous points in it. I think the ending was a little weak, but other than that it really spoke to me. And you know one of her key points is about living life takes guts. Being an entrepreneur, being a business owner, it takes guts. You’ve got to show up and you’ve got to get gutty. You’ve got to do stuff that might scare you. Dating certainly takes guts, and being your best self- until you really get there, it takes guts because you’re shedding old skin that isn’t who you are, and some people will follow you, some friends and family, and some won’t, and that is how life is. And- yeah, and that’s okay. That’s awesome. So every one of these interviews that I do has a blog post that goes with it. So I’ll make sure that all of the stuff that we’ve been talking about, especially that link to the book, I will make sure is in there. So if anybody is listening to this and they want to go check out that information, they can head over to the website and it’s episode number 32, they’ll be able to find that information. So thank you for that resource, I think it sounds interesting for sure. And I know- I believe- so she is an out lesbian herself, correct? She is. She’s got a great blog post that’s called ‘Fat, Gay and Broke.’ It’s great. I’m going to have to go read that. She is not broke anymore. Not from what I’ve seen. I saw her on the Inc. 5000 list I think she was on that I saw her recently. Excellent. So this has been an awesome interview. I love when it’s just a perfectly natural conversation and just full of good information. So I want to thank you so much for taking your time, but I also want for you to let the audience know, if they want to get in touch with you or find out more information, or any way to get in touch, how you would recommend they do that. Sure. Well they can check out my website which is www.GayGirlDatingCoach.com. They can reach me at Mary@gaygirldatingcoach.com. I certainly, if anybody’s got any questions, they want to know more about some of what we’ve talked about today, I’d love to share that. And right now my really super big project that I’m working on is the Gay Girl Love Tour. I’m busy booking workshops, dating workshops, and going into New York City for the whole month of April, and then I’ll be out in P-Town for spring, and then I’ll be out on the west coast for most of the summer, traveling up and down, and searching out the lesbians, and doing workshops, teaching them how to break through in their dating. There’s some fun things and some not so fun things. That’s life, and that’s work, and it has been an amazing experience. And every time I go out, I learn something new; I learn something new about marketing, I learn something new about my strategies for getting information out, my strategies for making workshops effective. So every single event is a test, it’s like I’m doing a workshop inside the workshop of what makes a business work, and how do you generate revenue, and clients, and a steady stream, and all those interesting things. Along with doing great work in the community. That’s awesome, so that’s all very important information, and important things that you’re doing that I think my audience would find value in. So if you are listening to this, I encourage you to go over and check out her website because it seems like it’s a treasure trove of information. Thanks, this has been really great Jenn. I’ve really enjoyed this conversation. This is awesome, thank you so much and we will be in touch for sure. Of course I cannot forget to mention my online training course, so have a listen to this. And finally, I have one last thing for you guys to all have a listen to, and that is a message from my good dear friends over at Teazled. Alright. I sincerely hope that you enjoyed today’s episode with Mary. She had some really awesome information to share about the lesbian target audience, and marketing to lesbians in particular. I know that that is something that I hear, or get questions a great deal about from a lot of people, is how exactly can I do this? So hopefully you learned a thing or two from Mary. And yeah that’s about all I’ve got for this episode. I really sincerely hope that you enjoyed the interview, and I look forward to touching base with you again in a couple of weeks when I bring you an all new educational podcast. Thank you so much for taking time out of your day today, and I will talk to you soon. ← How intimate is too intimate in a business setting? What questions are off limits?